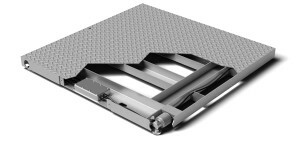 Based on feedback from end-users and distributors, Avery Weigh-Tronix is pleased to announce the availability of a redesigned ProDec (DSLS) floor scale. The complete stainless steel structure of the ProDec now incorporates hermetically sealed, stainless steel Weigh Bars as standard. Ideal for the hygienic requirements of the Food and Chemical processing industries, the hermetically sealed Weigh Bars are designed with high accuracy and reliability and are NTEP approved. The DSLS now includes a side access to the stainless junction box to further reduce the chance of food, debris and other matter from getting trapped in the creases of the junction box compartment. The redesigned ProDec is available in standard sizes ranging from 36 x 36 inches to 84 x 60 inches and capacities from 2,000 to 10,000 pounds.